The WaveTester is one of the most economical and precise fiber optic power meters in the world - delivering professional performance and a complete feature set for optical loss testing in both multimode and singlemode networks. 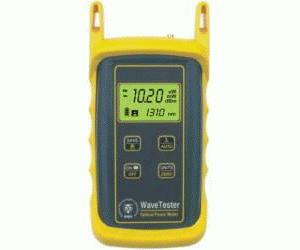 The WaveTester is offered in two models. The WT-1 is N.I.S.T Traceable at four commonly used industry standard wavelengths (850, 1300, 1310, and 1550). This makes it an ideal choice for both multimode and singlemode testing. The WT-1I is also N.I.S.T Traceable at the standard wavelengths, and also comes factory calibrated at 1625 nm. Each model of the WaveTester can store reference values for all of its calibrated wavelengths, and displays optical power as an absolute value in dBm or relative to a user set "zero" reference in dB. Stored data points contain this reference information, and when data is downloaded into our free OWL Reporter software, the data can be certified using one of many popular cabling standards. OWL Reporter can also print professional-looking certification reports as proof to customers of a job well done. OWL Reporter data can also be saved to hard disk for later retrieval. Other standard features include a backlit, easy-to-read LCD display and a 2.5 mm universal detector port that is compatible with FC, ST, SC, DIN, and any other 2.5 mm ferrule connectors! No need to maintain expensive adapter caps! The WaveTester is protected from shock and droppage by an attractive rugged rubber boot.